We’ve been comparing plenty of similar-but-different packaging materials lately—corrugate and chipboard, stretch and shrink wrap, even waxed bags and glassine bags. Even though they share similar properties, their uses make them quite different from each other. The same can be said when it comes to foam vs bubble. 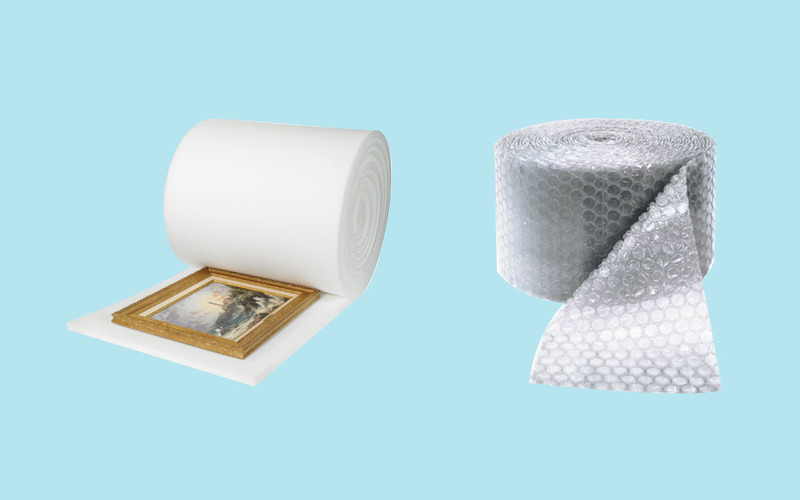 While both play vital roles in product protection, you’ll want to understand how each of these packaging materials can serve your needs best. Foam is a structurally-dense but lightweight material that’s made from a variety of polymers like plastic, latex and rubber. It’s ideal for absorbing shocks and impacts, preventing marring and abrasion, and providing structural support during shipping. Its wide range of available formats make it one of the most surprising and versatile packaging materials on the market. Foam planks provide a solid base to any shipment, and their density can be altered during manufacturing to provide stiffer or softer cushioning as needed. They can be cut into any shape needed or routed out to cradle and cushion oddly-shaped products. Anything from lamps and small furniture to car parts and electronics can be packed in foam. Foam rolls are long lengths of thinner, malleable foam that can be wrapped around products, layered between items, and even used as underlay cushioning for wood floors. Foam dispenser boxes (which house rolls of soft foam) can be easily transported by hand, and the foam is perforated every foot or so to make it easy to tear off. Foam sheets can be used in short-run packaging projects or while packing items during moving. Foam pouches make product loading and product separation easier, too. Foam also has optional properties that make it ideal for protecting different objects. Standard foam is soft, smooth and won’t mar or damage a product’s looks. Adhesive foam will stick to a product, negating the need for packing tape and preventing slippage during shipping. Cohesive foam sticks only to itself, preventing any adhesive from sticking to a product’s surface. Anti-static foam (in pink) prevents the build-up of static discharge, protecting electronic items and components from static shock. Best used for… glass and crystal, mirrored surfaces, kitchenware, components needing absolute separation from each other or products needing protection from shock and impact. Bubble (also known as bubble cushion or bubble wrap) is a packaging material made by trapping air in bubble-shaped cells between two layers of plastic. It’s ideal for preventing damage caused by shock, pressure or collision. Its plastic nature also gives it limited protection against moisture, depending on its use and how well it’s secured. There are 3 sizes of air cells available on the market, each meant for objects of varying sizes and weights. 3/16” bubble cushion is the most commonly used size, meant for protecting surfaces against scratches, dents and chips. 5/16” bubble cushion is used for larger or heavier items and provides greater shock absorption. 1/2” bubble cushion is used in more industrial settings to cradle large components and machinery, and as such, isn’t commonly used in commercial product packaging. Bubble cushion is manufactured and shipped in large rolls that can be cut down to lengths and widths better suited to specific applications—smaller dimensions wouldn’t protect large components, while larger dimensions would be a waste of material on dinner dishes. Big rolls are best for warehouses or high-volume projects as the rolls can be mounted on machinery for easy access. Small rolls are better for individual or low-volume projects, and can be bought in dispenser boxes that are easy to carry and contain perforated rolls. And just like foam pouches, bubble bags can make product loading and product separation easier. Much like foam, bubble cushion has optional properties that make it better suited for different products and projects. Standard bubble cushion is widely available and is always a safe choice. Adhesive bubble holds onto a product during shipping, while cohesive bubble sticks to itself to avoid marring the surface of the object its protecting. Anti-static bubble (in pink) prevents static charge build-up, making it ideal for protecting electronic products and components. Best used for… collectibles, fragile and valuable items, mirrors and artwork, moving purposes, protection of multiple or bulk items, void fill in boxes. Foam vs Bubble: What’s the Best Choice? The answer, as ever, depends. There’s so much cross-over between both packaging materials (and so many format options), that nailing down your choice can be difficult. Ask yourself a few qualifying questions and you’ll likely find the solution you’re looking for. Are you looking for product protection, void fill, or structural support? Are you packing commercial products, protecting components, or moving to a new home? Are you looking for protection against physical or cosmetic damage? Are your products flat or round, textured or smooth, generic or oddly-shaped? Are your products valuable, fragile, heavy or being packed with other objects? Whether you’re moving to a new home, selling off collectibles or shipping products and components, you’ll find situations where the foam vs bubble dilemma will come to mind. Both have strengths and uses and interesting applications, and it’s up to you to decide which serves your needs best. As you well know, The Packaging Company loves packaging in all its forms, so don’t hesitate to get in touch with us if you have any questions about which packaging supplies are right for your business.